Cambodia has developed into one of the most welcoming countries in the world and the number of tourists has swelled in recent years, with visitors eager to discover the temples, beaches and golf courses. Over 5 million people visited Cambodia in 2016 and the tourism industry, along with textiles, is their major economy. Golf plays a large role is Cambodia’s tourism and some of the top golf course designers from around the world have used their skills to produce some excellent courses in the country. 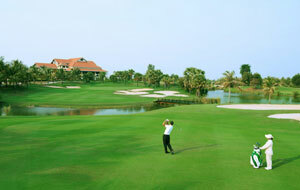 Cambodia was the host of the 2009 Johnnie Walker Classic and continues to attract big tournaments on the PGA Asian Tour. If you have never considered a Cambodia golf holiday, read on to find out more about this fascinating Asian country and the tremendous golf courses which lie in wait. Cambodia is a mainland, southeast Asian country and shares borders with Thailand, Vietnam, Laos and the Gulf of Thailand. The two main geographical features of Cambodia are the central plains and the mountain ranges to the north, east and south of the country. Cambodia enjoys a long coast to the south and southwest which extends over 400 kilometres along the Gulf of Thailand. This region of Cambodia has peninsulas, beaches, bays and mangrove marshes to visit. The longest river in Cambodia is the Mekong River which bisects the country and disperses into the central wetlands. In addition to the mainland, there are 60 islands in the water off the coast of Cambodia, only some of which are inhabited and can be visited. Cambodia has a tropical climate but is easy to follow thanks to the distinct seasons which dominate throughout the year. The entire country is subject to the same weather in most cases, with only minor differences, so where ever you play golf in Cambodia, the climate projection for the country is very accurate. The two seasons are the dry season and the wet season. The peak time for playing golf in Cambodia is the dry season and this falls between October and late April. The months of October, November and December are the coolest months of the year, with temperatures around 24 to 26 degrees. So, if you live in a country which is in the grip of winter by December, Cambodia is a great country to visit to enjoy some pleasant weather and excellent golf. The wet season is between May and late September. While travel to the remote areas of the country can be difficult during this time, the rain sees lush greenery around Cambodia and this makes for a good round of golf. Cambodia has two international airports at Phnom Penh and Siem Reap. However, there are no direct flights from Europe, so you must travel via another Asian country such as China, Malaysia, Singapore and Qatar. Bangkok Airways, China Southern Airlines, Korean Air, Malaysia Airlines, Qatar Airways, Singapore Airlines and Vietnam Airlines all fly to Cambodia. Having arrived in Cambodia, you can use public transport to get from the airport and into Phnom Penh or Siam Reap. Once in the city, you can use the same transport to get around and many of the buses have air conditioning. If you fancy something different, simply stand on the edge of any street and someone will offer you a lift on their bike, charging a small amount for the privilege. The Cambodian government has been working hard to improve the roads in the country and while this makes travel by car easier, driving is still not recommended for foreign tourists. When travelling to a golf course, ask your hotel if they can book you a taxi or hire a driver to take you there and back. Always agree on a price before you begin the journey. Cambodia has a fascinating and somewhat turbulent history but while the dictatorship of Pol Pot has received much attention, the country has enjoyed long and successful periods. The Khmer Empire was once very wealthy and one look at the temples at Angkor is testament to their riches and power. The empire was so powerful, it encompassed parts of other countries including modern day Thailand, Malaysia and Vietnam. From the 1860’s onwards, the French took control as they aimed to gain dominance in Indochina and in the 1960’s and 70’s, the United States became involved in the Second Indochina War, bombing the country. Having suffered at the force of the Communist Khmer Rouge in the 1970’s and 80’s, Cambodia has emerged as a welcoming country for tourists and the people are only too willing to go out of their way to make visitors welcome. A golf holiday to Cambodia is not only a great way to spend time on some fantastic golf courses, it will also open the eyes to what has become a tremendous country and group of people, with some fantastic historical temples and architecture. The official religion of Cambodia is Buddhism and roughly 97% of the population follow Theravada Buddhism. This branch of Buddhism developed in Sri Lanka before spreading to the rest of southeast Asia. The Buddhist monastery and monkhood are at the centre of religious life but interact with indigenous beliefs including ancestors and spirits. Islam, Christianity, and tribal animism making up the bulk of other religious beliefs in Cambodia. As when visiting any foreign country for a golf break, you should ensure you have at least six months remaining on your passport from the time you plan to leave. Almost everyone entering Cambodia needs to obtain a visa and this includes the United Kingdom, European Union countries, Australia, New Zealand, Canada and the United States. This may change in the future so always check the entry requirements before travelling. It is possible to obtain a visa for Cambodia before travelling if you are arriving by air and you can do this using an online e-visa service. It is also possible to obtain a visa on arrival at either Siem Reap or Phnom Penh Airport for a fee of $30 but you may be forced to wait in a long que, so if you can, use the online e-visa service. If you are arriving into Cambodia at a land border, you can obtain your visa at the arrival point for the same price as the airport plus a small stamping fee. There are no rules in Cambodia which say you must tip at a restaurant or having received a service and if you decide not to tip, you will not be frowned upon. However, it is worth remembering that people in the service industry in Cambodia will not be on good money and leaving even the smallest tip can make a big difference. In terms of the tip amount, again it is the choice of the individual but 10% is generally considered as the standard. 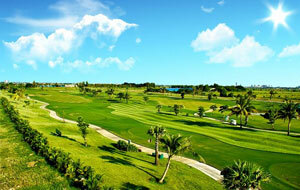 Having arrived and settled in to your accommodation you will be itching to get on the golf course. 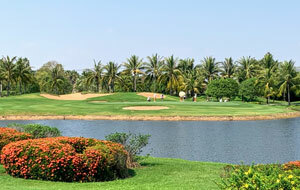 There are some fantastic golf courses to enjoy in Cambodia and we have split them up between Phnom Penh and Siem Reap. 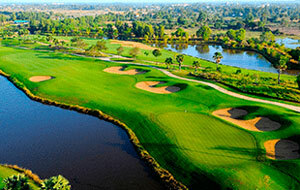 This will make things easier when deciding on which Cambodia golf courses you would like to include on your itinerary. Phnom Penh is the capital city of Cambodia and has retained much of its historical charm thanks to traditional Cambodian Buddhist wats, palaces and the promenade. Thanks to the rise of five excellent golf courses in and around Phnom Penh, the city has not only become a great place for sightseeing but a tremendous location for playing golf. The oldest golf course in Phnom Penh is Cambodia Golf and Country Club and it opened for play in December 1996. Situated just over 30 kilometres to the west of Phnom Penh, Cambodia Golf and Country Club was designed by Japanese and Taiwanese architects and boasts native fruit, plants, flowers and rocks. The front nine holes are flat, with wide fairways but there are many sand traps meaning accuracy remains essential off the tee and on approach to the greens. The back nine offers more of a challenge with some hilly sections, longer fairways, water hazards and smaller greens. Moving back towards the city and arguably the best golf course in Phnom Penh is the Jack Nicklaus designed Grand Phnom Penh Golf Club. This is situated just 20 minutes from the city centre and with very little development surrounding the course, the air feels fresh and the climate less humid. The fairways and greens are always in excellent condition and Grand Phnom Penh Golf Club is a nice, open golf course, with wide fairways but this means the wind can whip across the course and this adds to the challenge. Bunkers and water hazards are the main obstacles to avoid on this course and there are two large bodies of water to look out for across the 18 holes. The clubhouse is to an international standard, with a spa, sauna, restaurant and excellent customer service. Competing with Grand Phnom Penh Golf Club for the title of best golf course in Phnom Penh is Garden City Golf Club. This course opened in 2013 and immediately established itself as one of the best in this region of Cambodia. The course has been designed by architect Major General Weerayudth Phetbuasak to be a test for both amateur and professional golfers alike and he has succeeded in his aim. With little roll on the fairways, playing from the championship tees which stretch to 7.360 yards is tough for most golfers and with large greens and water hazards throughout, good club selection is vital if you want to avoid a long putt or seeing your ball in the drink. 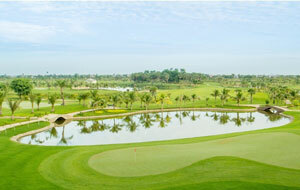 Additional golf courses in Phnom Penh include Royal Cambodia Phnom Penh Golf Club and Vattanac Golf Resort. Located in the northern provinces of Cambodia, Siem Reap may not be the first place which comes to mind when considering a golf holiday in Asia but it boasts three excellent golf courses, in addition to many tourist attractions. Starting at Phokeethra Country Club, the course which has played host to the Asian Tour's Johnnie Walker Cambodian Open, you have a great choice of world class golf courses in Siem Reap. Situated between the airport and town, the course maintains excellent playing conditions throughout the year and the generous fairways and greens make it a good choice for players of all abilities. However, with lagoons and bunkers scattered throughout the 18 holes, you cannot afford to switch off if you want to score low, especially as water features on all but one of the holes. Look out for the 18th hole, which has a double water carry to an island green and is a great way to end a round of golf at Phokeethra Country Club. Jack Nicklaus is not the only big-name golfer to have a golf course in Cambodia and in 2008 the Nick Faldo designed Angkor Golf Resort opened for play. Just 5 kilometres from Siem Reap, Angkor Golf Resort is considered by many to be the best golf course in Cambodia and is a must play during your Cambodia golf holiday. Faldo received a blessing from local monks when he opened the course and as one would expect from a IMG managed golf course, it has been kept in magnificent condition. While the water hazards and sand traps are strategically placed and tricky to avoid, they are easy to spot from the tee boxes, so good club selection and accuracy will help in avoiding them. The understated undulations on the greens are just enough to get players thinking and considered approach shots well help avoid long, awkward putts. The final three holes are the pick of the course and water plays a huge role, especially on the 17th hole, where the green is guarded by water along the right side. Water is also in play, this time down the left side of the fairway, on the 18th hole. Boasting great practice facilities, including a 330-yard driving range, Angkor Golf Resort is a superb place for a round of golf in Cambodia.